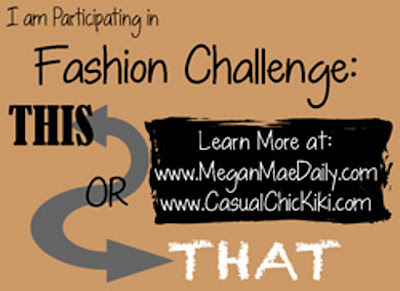 First of all, a big thank you to Megan and Kiki, who coordinated the "This or That" Challenge last week! What a blast! Secondly, kudos to Patti of "Not Dead Yet" Style for her awesome Visible Monday series! 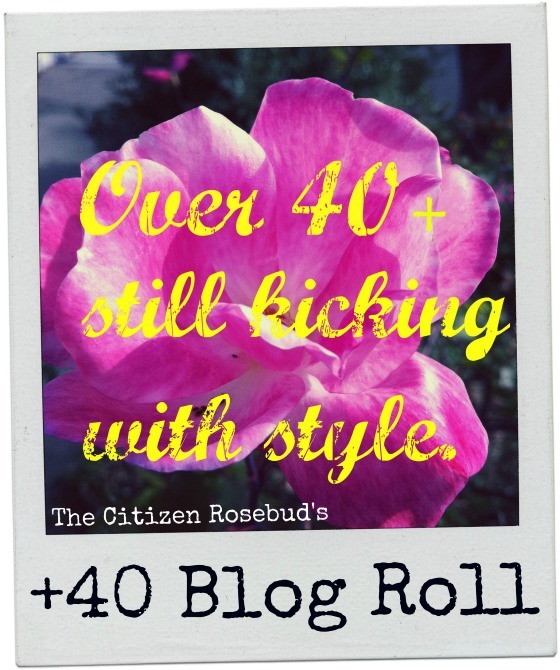 I'm only 44! I'm not dead yet! (I'm sometimes a zombie, though, hee hee). And lastly, a congratulations to the awesome Wendy Brandes for her latest HuffPo article (I'm the last picture in the slideshow) on houndstooth! Unlike my spectacular Mad Hatter costume from last year, this year I decided to tone it down and just be Hallowe'en-ISH for work. 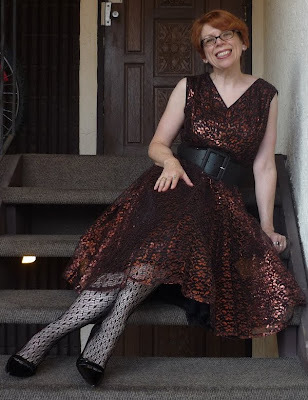 However, rather than join the masses of people wearing black (with a bit of orange thrown in), I chose to dig out one of my vintage dresses (oh, and a shout out to Jody of "Couture Allure Vintage Fashion" for featuring Hallowe'en costumes with vintage clothes!). So here I am, not quite in costume, but not quite normal either: I last wore this dress here in 2008, for a party. Isn't it amazing? 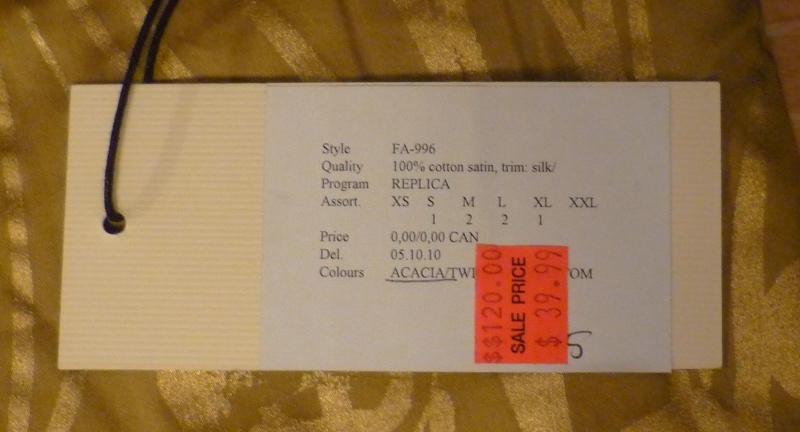 I bought it at Value Village about 10 years ago for less than $10. The lace is very crunchy (and itchy). It makes my waist look smaller, but it also gave me lots of swooshiness (I'm sure that's a technical term) when I walked around the office. 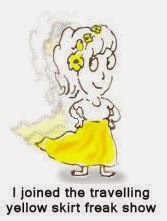 I gave a few people a good twirl when they saw me! He's very lovey in the mornings, especially when trying to get at my glass of milk. Same shoes as last week. My solid black belt was a good purchase 4 years ago for $9.99 in a gift shop in Times Square, NYC! Both rings are now vintage - I have to accept that 80s stuff is vintage (*sob*). I bought myself the snake ring at the local museum gift shop in 1985-6; Mom and Dad bought me the spider one for Christmas around the same time. 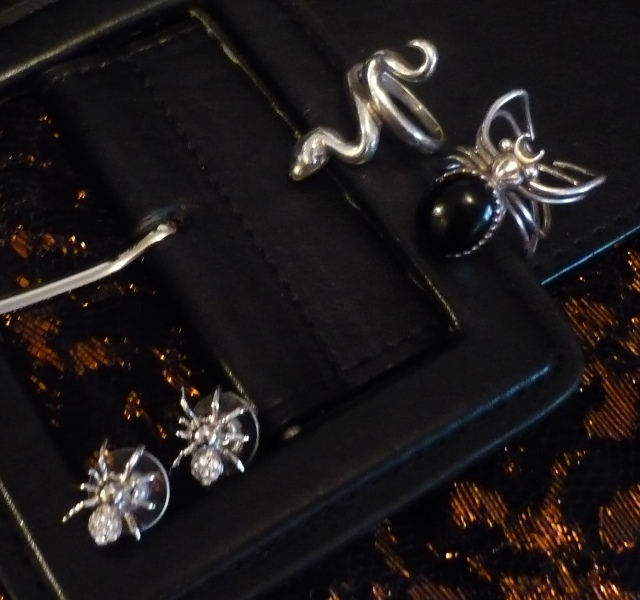 Thanks, Cindy, my ex-sister-in-law, for the spider studs! I love them! 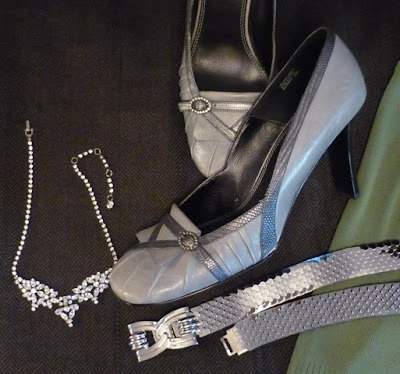 Dress (no label, vintage late 50s/early 60s), belt (no label), shoes (Guess), rings (80s vintage), earrings (gift). Well, my super-busy weekend is just about over - I guess I'd better post Friday and Saturday's trend outfits! I bought this insanely beautiful chartreuse skirt at Dots with the birthday gift card from my gorgeous Winesday Women. 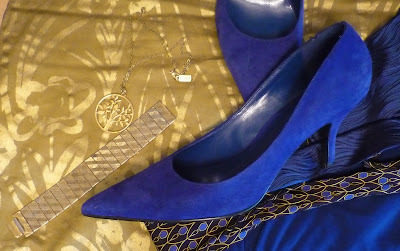 I loved how it looked with cobalt blue. Of course I had a coupon, so it was an extra 30% off, so $27.99. Not bad. I like that the colour name is "acacia" - I think that's a tree. 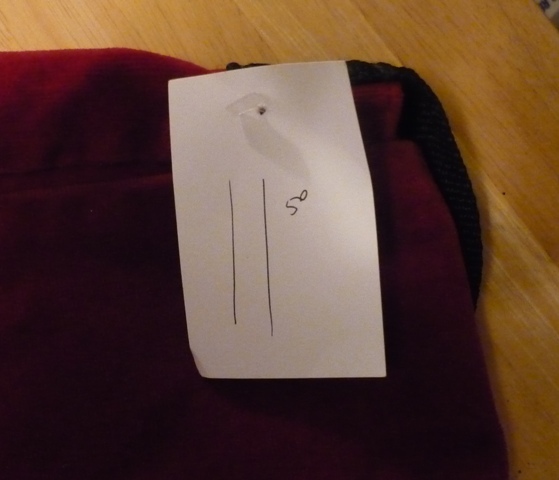 I wish I'd worn a slip with it - the lining is also cotton and it clung to my tights all day. 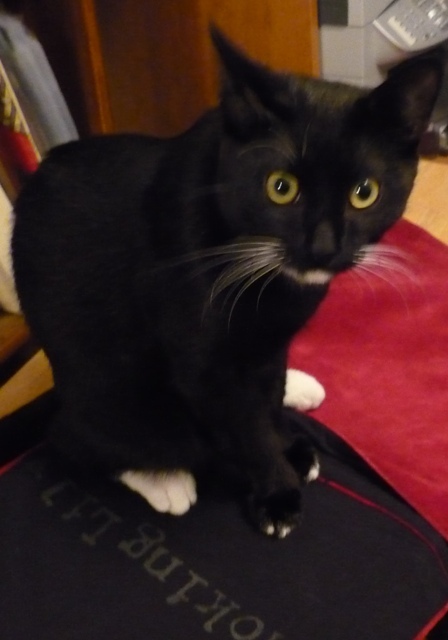 Vizinni was very helpful with the pictures. I've been wanting to wear this awesome obi that Megan made for me out of two of Ally's ties for ages! Finally found the right combo. I note (according to my Glamour magazine) that gloves are trendy again. I say, "When are they not??" I love leather gloves especially. These navy ones are going to get a lot of use this winter. I got these at Dots as well. $29.99 for InWear - and these were 30% off as well! so $20.99. That's good for leather - they're lined in a wool/cashmere blend too. 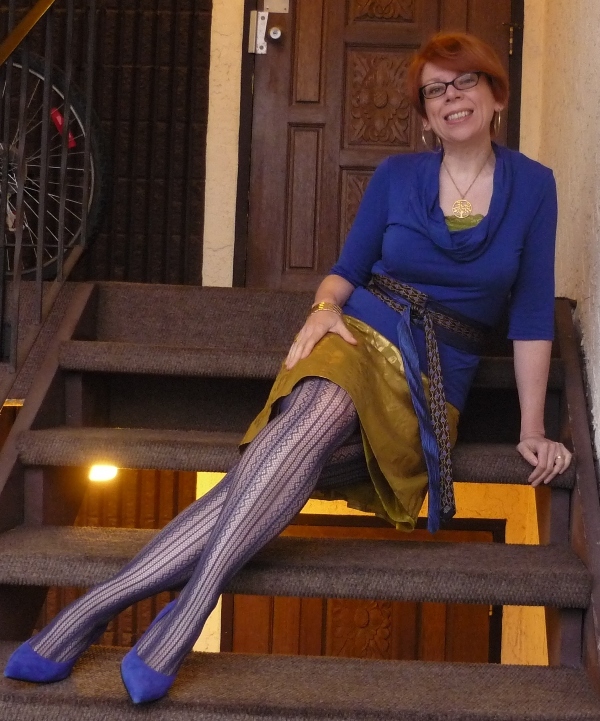 I was pleased with how the blue lace tights looked with this, despite the skirt creep all day. The gold flowers on the skirt are actually painted on the fabric. 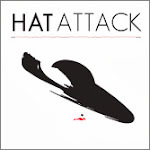 It's very cool looking. That's a better shot of the two tie fabrics on the obi as well. 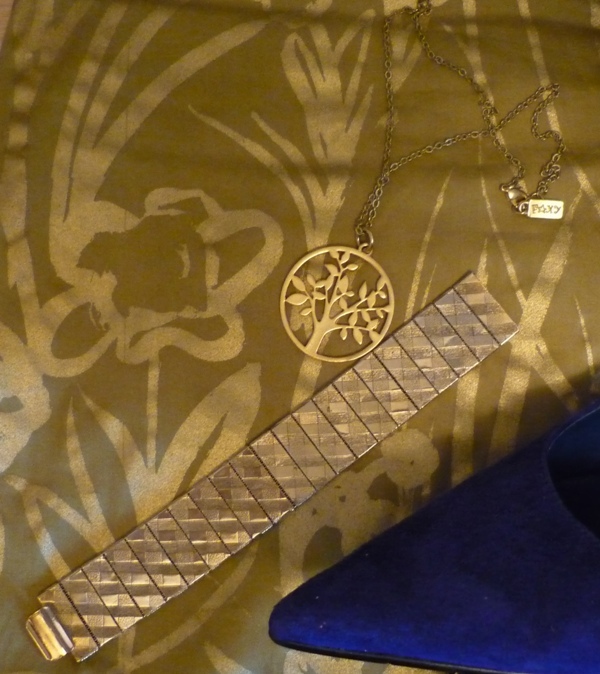 My tree necklace and Mom's bracelet from the 60s that I've had since the mid-80s. Top (Oxmo), cami (Ricki's), skirt (Noa Noa), tights (Silks), obi (handmade, gift from Megan), necklace (Foxy), cuff bracelet (vintage 60s, Mom's), shoes (Feet First). I had to rush home after work and get changed to go out for dinner. L and I accidently double-booked a friend's gallery opening and another friend's birthday party, so dinner was the only time we spent together all day. 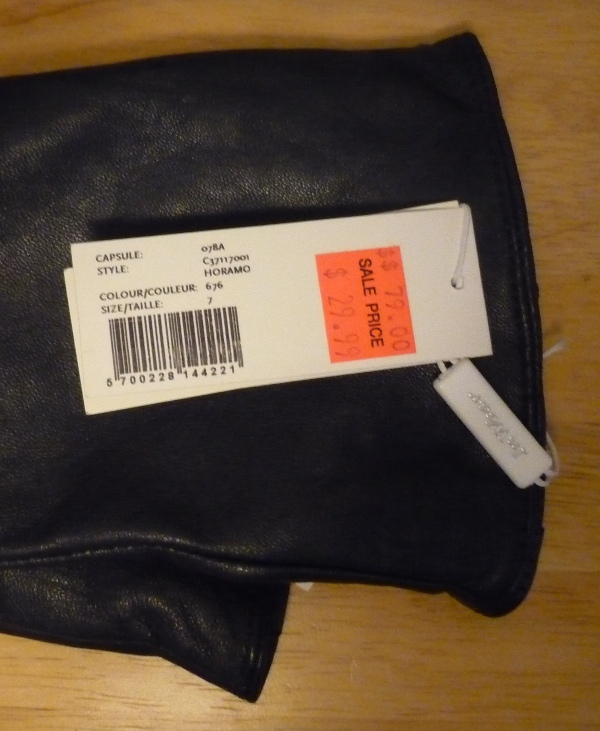 My leather pants, that is! I swapped out my green cami for an olive and copper sparkly one, then just changed from skirt and tights to pants. I also added my copper skull cuff. I felt like million bucks in these pants. I'm still boggled that I found leather pants in a thrift store that fit me like they were made for me. 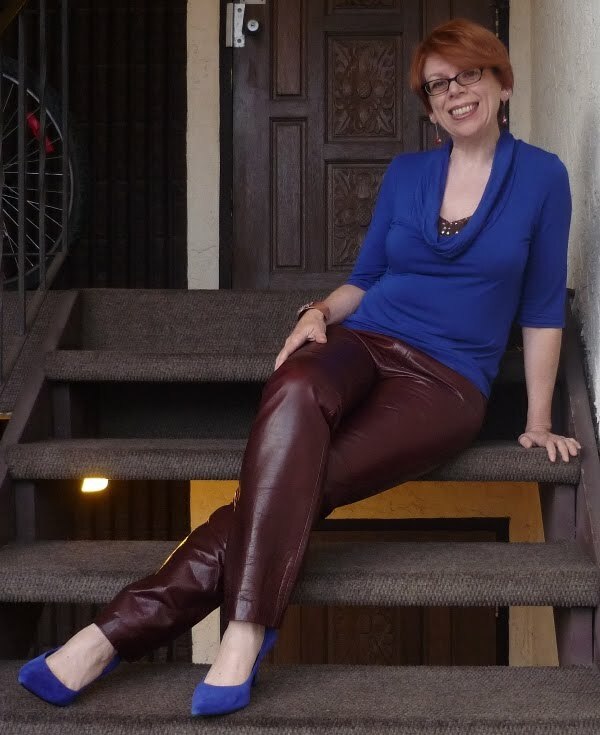 Check out the Story of the Leather Pants if you haven't seen it before - these pants have history! And my Coach bag. I'm leather tip to toe! So badass, hee hee. I had a blast and walked home in these shoes at 1:30 am. L arrived home soon after. Jacket (Le Chateau, consignment), top (Oxmo), cami (Esprit, thrifted), pants (Gap, thrifted), shoes (Feet First), bag (Coach, thrifted), gloves (Parkhurst). *yawn* I crawled out of bed at somewhere around 1pm on Saturday. L and I decided to go for lunch, so I pondered what my Favourite Fall Trend was while I stared at my closet, and decided that it is the maxi skirt. I just love the look of it (and I wore it all summer, so I'm really glad it's still "in"). My denim maxi has seen lots of wear since I got back in October 2010 - I only paid $8.50 for it, so I think my cost per wear is down to about a dollar! Other favourite trends in this outfit: stripes, fall brights (the olive sweater), booties with studs. I even have long striped socks on (easier than wrestling with tights! ): And since it was so sunny yesterday, I didn't go overboard with my outerwear. But it's another fall trend! Faux fur vests! I felt very stylin' and wore most of the elements all of Saturday night. Every year on Hallowe'en weekend, we have a bunch of friends over for Scary Movie Night. I did up goodie bags of popcorn and some candy, and we watched "May", "The Orphanage" and "John Carpenter's The Thing." All excellent and we had a great time! Are you dressing up for Hallowe'en for work tomorrow? I am not going in costume (I have a 3 hour meeting on Mondays, and it's not the image I want to project to upper management), but I'll be in some black and orange vintage! Today's challenge: Dots or Stripes! And this is why I didn't save the holey tights from yesterday for today! It's stripey legs! Wee! I've had these tights for a few years now - got them at Winners on one of my expeditions. 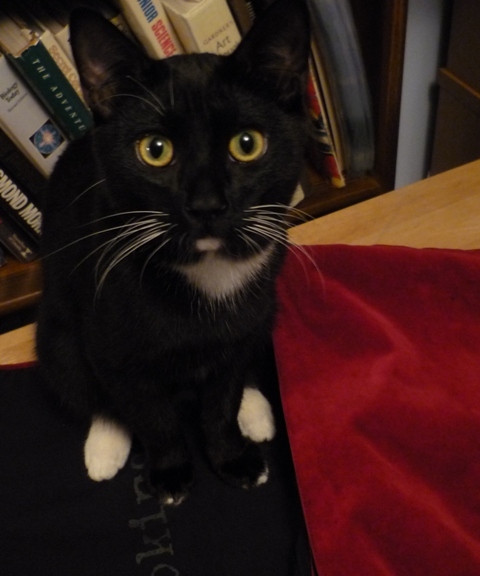 It really is striped, honest. 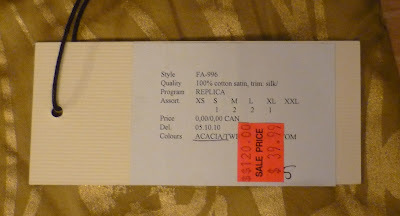 Only worn once, here (3rd outfit down, very casual) - now my cost per wear is down to $3.25! 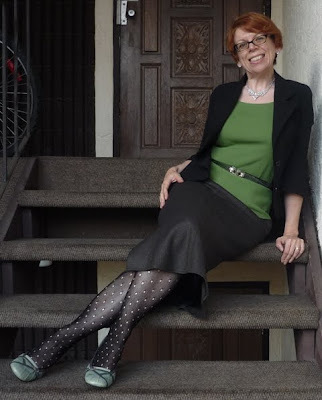 The blouse is a micro-polka dot (2nd outfit down), and that's my lovely grey velvet skirt (3rd outfit). All very exciting indeed. 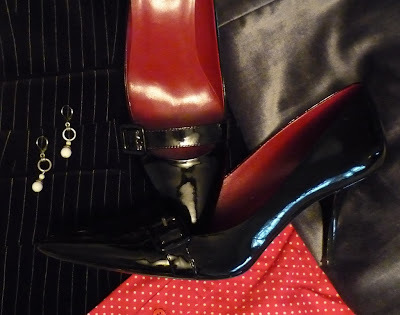 I have very few "plain" shoes - these are the closest I still have to a classic black pump. I love them. Oh, and there, see? Stripes and dots - told ya! Blazer (Ann Taylor, thrifted), blouse (Jacob), skirt (Club Monaco), shoes (Guess), earrings (Plum). 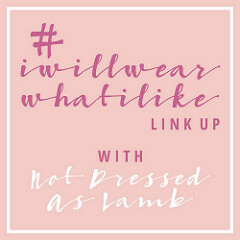 The theme for today is for skirts: midi length or maxi. 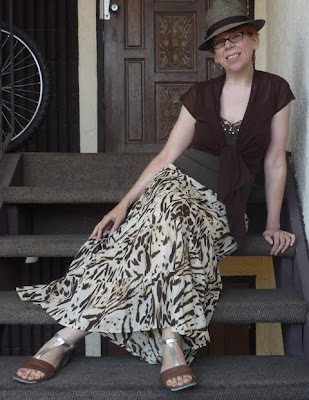 I've done tons of maxi skirts over the past year or so (summer, spring, more spring, yet more spring, winter), and I've done midi skirts for ages as well (here, here (2 midi skirts in one post!) and here, just for a few). 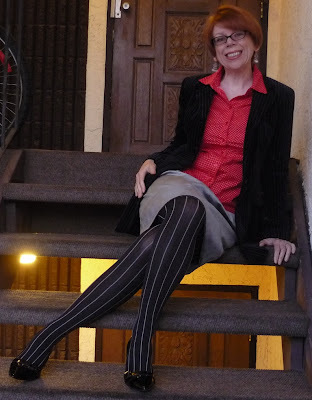 I like all different skirt lengths - I always have! - and having these suddenly be "in" is like saying chocolate is yummy. Well, duh. Today, I wore another one of my midi skirts, this fabulous one that Megan sent me! How appropriate, since she is one of the co-hosts of this challenge! I feel bad that it's been so long since I wore it, but it is wool and is not really a summer skirt. A couple of new things in the outfit. The green knit shell (it's sleeveless) was thrifted for $6.00, the belt was purchased at the Vintage Fair for $2.00, and the tights are another pair I picked up at Esprit some months back. 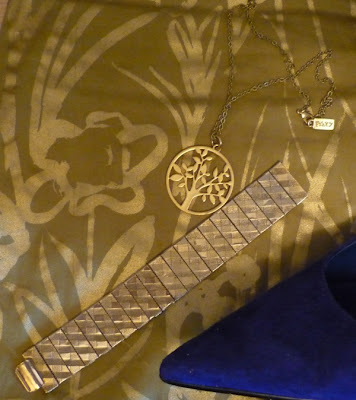 Oh, and the necklace is new-to-me too! I haven't worn this jacket in forever (since June 2009)! 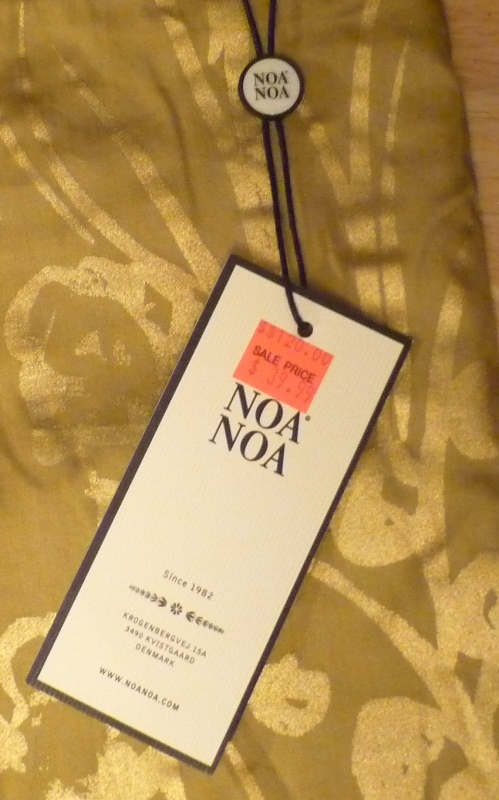 I hang onto it because I have long dress pants and a pair of cropped dress pants that match the fabric exactly (um, Sheila, that's called a suit). Check out the vintage 80s belt! Each row of "scales" is sewn onto a thick fabric/elastic backing, so the whole thing is one big stretchy snakey...belt! I remember belts like this in high-end shops (like Suzy Creamcheese for those of you who are of that era), and wanting one bad. Isn't that a lovely necklace? My friend Allison works for Women in Need (the thrift shop chain I patronize quite a lot), and she bought this for me for my birthday. I gave it a good scrub with a toothbrush and some soap and it came out lovely, all sparkly! 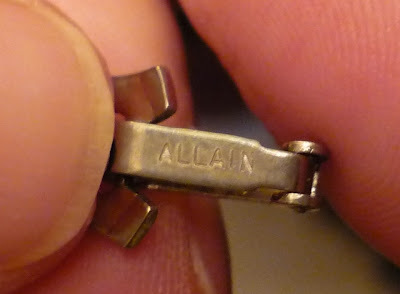 That says, "Allain" - a quick search doesn't tell me anything about the maker, other than this is probably from the 50s or 60s. But what an awesome gift! 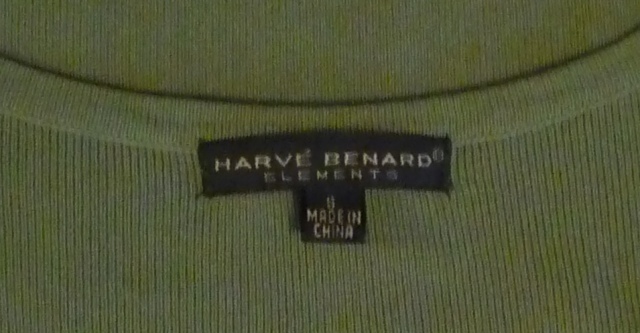 Never heard of him, but apparently the clothes are sold in "fine stores" - probably for more than $6.00. Jacket (Max Studio), top (Harve Bernard, thrifted), skirt (Etcetera, gift from Megan), belt (vintage 80s, thrifted), tights (Esprit), shoes (Hilary Radley, consignment), necklace (Allain, vintage 50s-60s, gift from Allison). You know I'm not one to shy away from a challenge, but these awesome wide-leg trousers (not worn since February! for shame!) were perfect for today's theme. 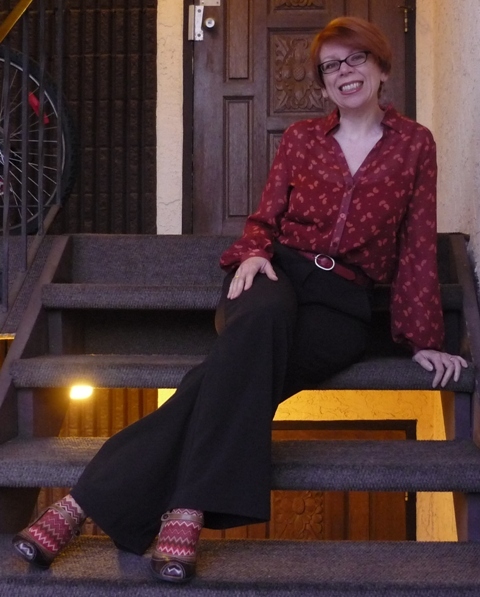 Tossed on a rust-coloured cami underneath (the blouse is rather sheer), added a red belt, and my two-tone Oxford-inspired shoes. And that's a new-to-me Smoking Lily bag I found in the thrift store last week! 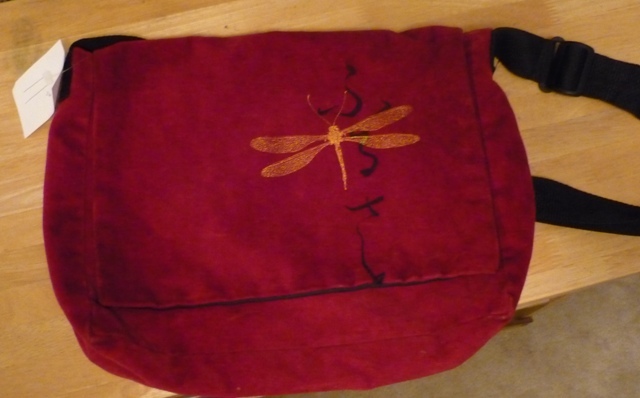 It had an extra strap that I think was supposed to go around one's waist, but it was huge, so I cut it off. Yee haw! I searched to see if I could find any comparison for this online, but this style hasn't been made in over 7 years. 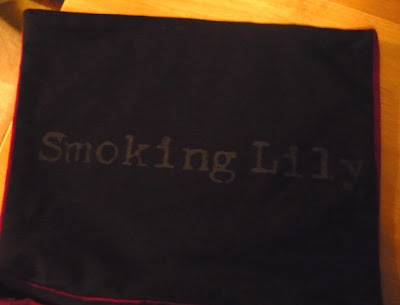 The only reference I found was to someone who pined for a velvet Smoking Lily messenger bag, but they were too expensive for her. I am betting they were not $11.50 new. Man, the light is getting bad now. So dark, so early! 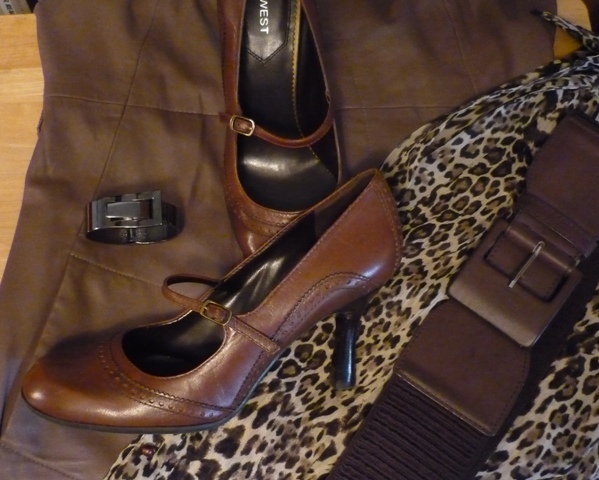 Jacket (Le Chateau), blouse (Liz Claiborne), pants/belt (Plum), shoes (Unlisted), trouser socks (Oscar & Libby's), bag (Smoking Lily, thrifted). One of my many pieces of leopard I own (in case you didn't know, I did a Leopard Week earlier this year and was featured in this Wendy Brandes article), this blouse (last seen here - last outfit - only 2 weeks ago) is becoming a real workhorse in my wardrobe. Just for fun, I thought I'd wear the $20 leather dress to work with it! And heck, let's toss in some fishnets while we're at it, shall we? I'm a little blurry on Monday mornings. The shoes are new-to-me, picked up on Friday after work on my thrifting jaunt with Lesley to the local Women in Need. I spotted them on a display (always loot the displays), and saw how nice the quality was. And in my size! Wee! Such a classic shape! 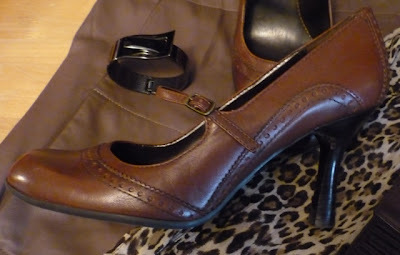 I love the Oxford details and the delicate Mary Jane strap, not to mention the slight flare of the heel. 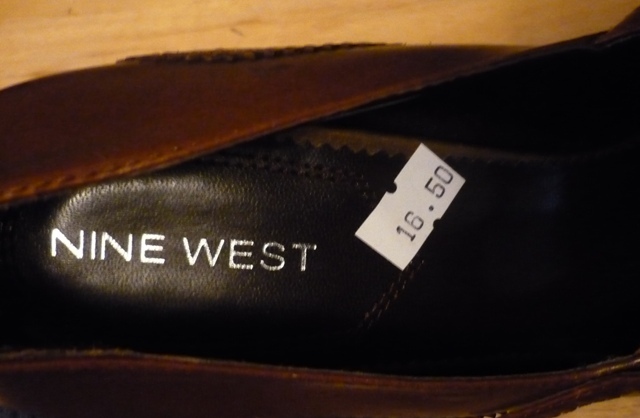 They're by Nine West and are leather. I think they've maybe been worn once. I'm boggled at how women will discard or donate barely-worn shoes. Not complaining, mind you! Keep on donating them, please! Yeah, score. I was happy with that. 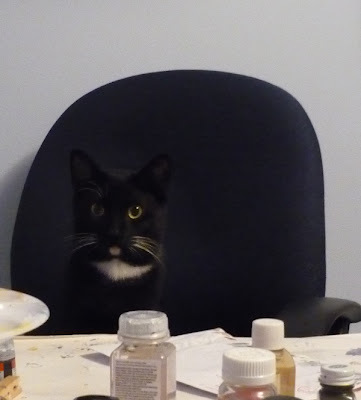 I'm also participating in Visible Monday! Go, Patti! 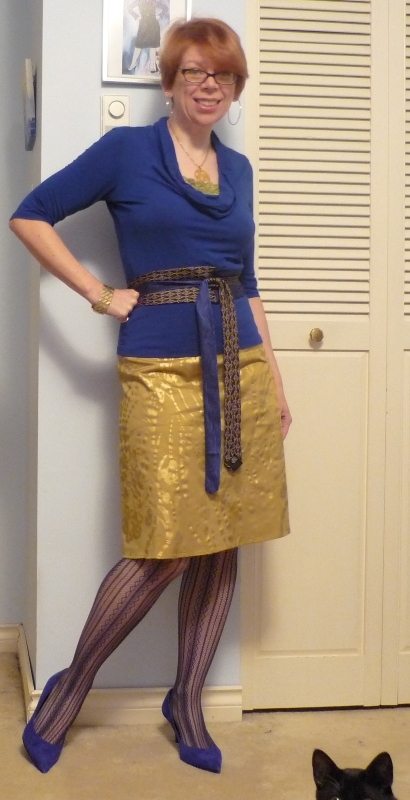 Blouse (Planet, consignment), dress (Truly, Part Two), belt (Plum), tights (Esprit), cuff (birthday gift from Mom). 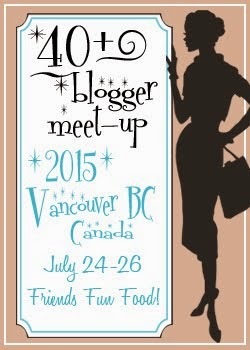 Reader Challenge - With Prizes!